I never really wanted to go to Hawai’i. Sure it has Hula dancers and volcanoes, but in all the magazines and friend’s photos, Hawai’i looked pretty much just like Florida or some other place in the Caribbean I could get to on a much shorter flight. It’s not. 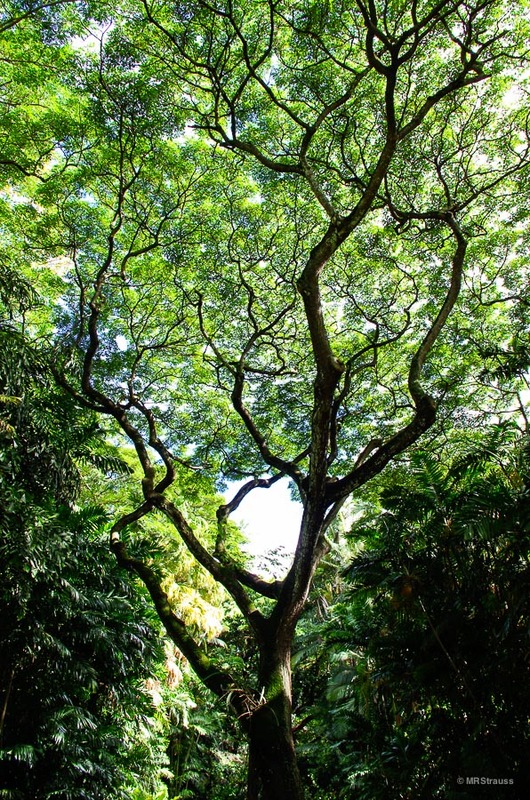 Step outside the resort areas and Hawai’i is a rural, wild, and brutally beautiful place. Even the chickens are wild. Later we find out they were set free, or rather blown free, by hurricane Iniki and have since thrived on their own. 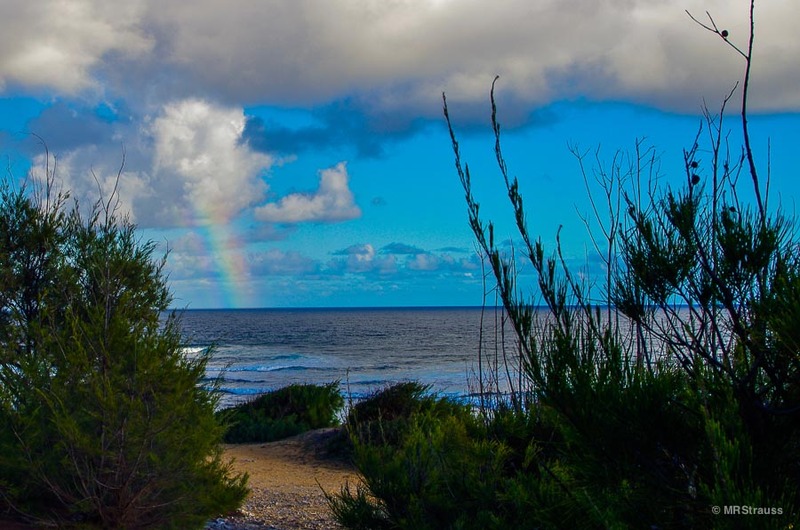 We visited the four main islands— Kaua’i, Maui, Hawai’i (or Big Island) and Oahu. We had 22 days from late October to the middle of November to explore and this wasn’t nearly enough time. But that’s just a good excuse to go back. And live there forever. Nearly all the reviews of our hotel gushed about the lei greeting; somehow these special touches always elude me. We made it all the way to the reception desk when I was asked “did you get a lei?” “No.” “How many people?” “Four.” The receptionist hiked four beautiful flower leis over the counter. It was only later that we realized my husband should have had a kuki nut lei (he was getting our bags out of the car). He looked pretty though and the breeze from the ocean and the scent of the leis made it impossible to complain. We were officially hypnotized. The one thing I like about traveling west is that I get the right kind of jet lag— my night owl turns into an early bird. We had an ocean front room facing east; we left the curtains and the lanai doors open overnight so we could fall asleep to the sound of the ocean. 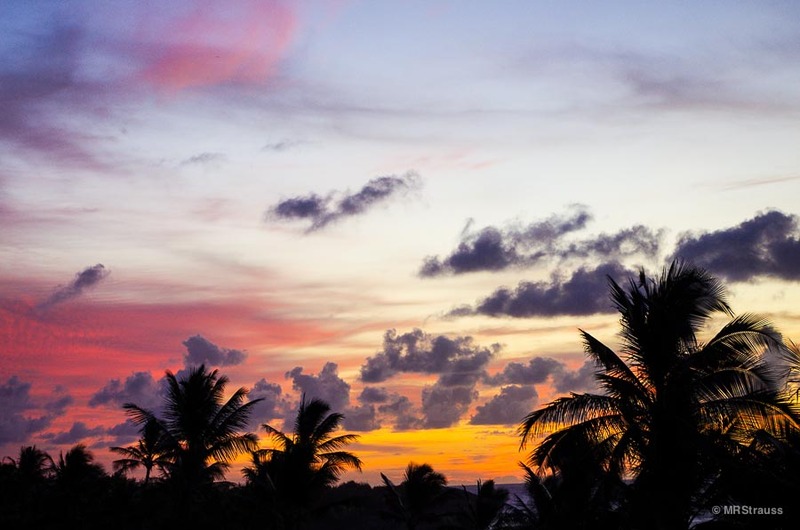 When I opened my eyes, the sun was just beginning to rise; at first it was the slightest tinge of pink on the clouds behind a silhouette of palm trees, then the blues began to lighten and some tangerine joined in. All this while I’m lying in bed. On our first day we took a boat trip to see the Na Pali coast— the scene stealer in movies requiring a lush but forbidding landscape. One thing I learned about Hawai’i is that, while the islands may not really have seasons, the water does. If you want to kayak, snorkel, or just swim, the water is calmer in the summer months. In the winter, particularly in the north and west (windward), the water can be brutal— good for surfing though. 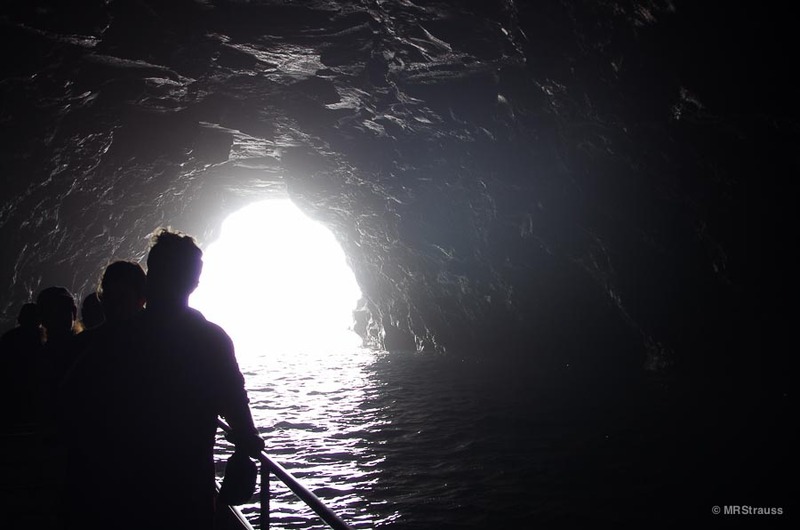 When we went, it was between seasons; we happened to get lucky and the water was calm enough to go all the way up the coast and even enter a sea cave but we had to go in the morning. On the way back, we stopped at a spot to snorkel; the water here is so clear it’s like a giant aquarium, you don’t even need to snorkel to see the fish— we saw flying fish, turtles, dolphins, and all sorts of colorful fishies. One thing I will say is that if you have the option to do this trip in the afternoon (which would be more likely in the calmer water summer months), the sun will be shining on the cliffs rather than coming from behind, as it is in the morning. This would make the scenery easier on the eyes and much, much better for photos. Na Pali coast washed out in the morning sun. The next day, we tried snorkeling at Lawai Beach. We went with SeaFun Kauai as I wasn’t really comfortable taking my kids out in the real ocean by myself. Up until this, the only snorkeling we had done was in the highly controlled environment at Discovery Cove in Florida. It’s amazing what you see just putting your face in the water: we saw a whole aquarium’s worth of tropical fish and got hugged by a little octopus— they feel like velvet but they stick like glue— I was afraid one of it’s legs would rip off. We were also supposed to snorkel in an area with sea turtles, but the water was getting a little too rough— in Hawai’i, the water is always in charge. We were lucky that SeaFun had us in wet suits: the water gets pretty chilly when you’re just floating around and you can get a pretty nasty sunburn on your backside without realizing it. While we were snacking afterward, we saw another group go in without wetsuits and mostly everyone came out shivering after about twenty minutes. We were in for a whole hour. That afternoon we hiked the first of many stunning trails. 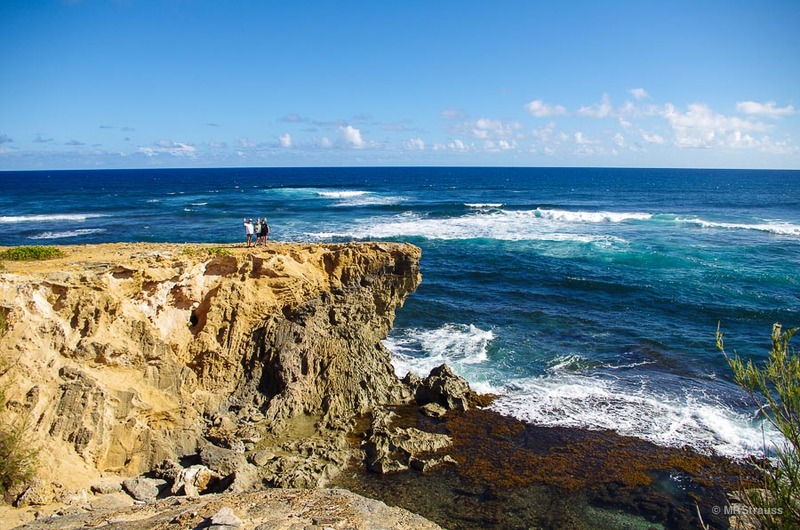 The Maha’ulepu Heritage Trail is not difficult —we were able to pick it up at the end of the beach from our hotel— but trying to take in the dramatic lithified sand cliffs, sapphire water, tide pools, and rainbows really slows you down. I half expected a unicorn to run past us. Having done a balloon ride in Arizona, this seemed the place for a helicopter ride. We saw Waimea Canyon, which we would hike through later in the week, the Na Pali coast (again with sun behind since it was morning), and a really dramatic up-close of Manawaiopuna Falls which were featured in Jurassic Park. Some trips briefly land there a la the movie scene, but only on certain days— because the falls are on someone’s private property. You get a really good and close view from the air though. This was also the day we discovered Savage Shrimp. They were mentioned a few times as a food truck in travel blogs I read before the trip. Now they are tucked in the side alley of a shopping center not far from our hotel. They are all about shrimp: not too big, not too small shrimp, deveined with shells on in a garlicky finger-licking sauce, a lightly dressed mixed cabbage salad (I’m calling it cabbage salad because where I live ‘cole slaw’ is the tribal word for ‘one who swims in mayo’) and a scoop of rice. This and Hawaiian Sun Passion Orange was pretty much all we ate for dinner the rest of the week. I wish I could figure out how they got the garlic flavor to pop like that— it wasn’t raw, but it was GARLIC in all caps. Trips like this are always a good excuse to try new things, to be the adventurer, to boldly go where, well, lots of folks go, so I booked the Kipu Zipline Safari through Outfitters Kauai. This is not really an exclusively Hawaiian thing to do, but it seemed like a good place to do it and my kids were both the right age. The trip involved a short kayak, which unfortunately was in a tandem kayak—unfortunate because I wanted to see how far my younger daughter could paddle so I could take her on trips back home. However, she saw no reason to paddle if her sister was in the boat with her. And she didn’t just not paddle, she let her oar drag in the water and complained about how slow they were going. Her sister tried to smack her with the paddle, but she couldn’t get enough leverage. Then it was over Kipu Ranch in a ‘farm wagon’. The ranch, we were told, was used in Jurassic Park and Raiders of the Lost Ark, but all the voodoo natives and dinosaurs must have run away because it looks like a a regular farm now. And finally the zipline. You never realize how strong your survival instinct is until you have to jump off a ledge, but we all did it. Before the day was up, we visited some swimming holes that you could swing into, one of which involved my older daughter getting a bunch of little fish stuck in her swimsuit. 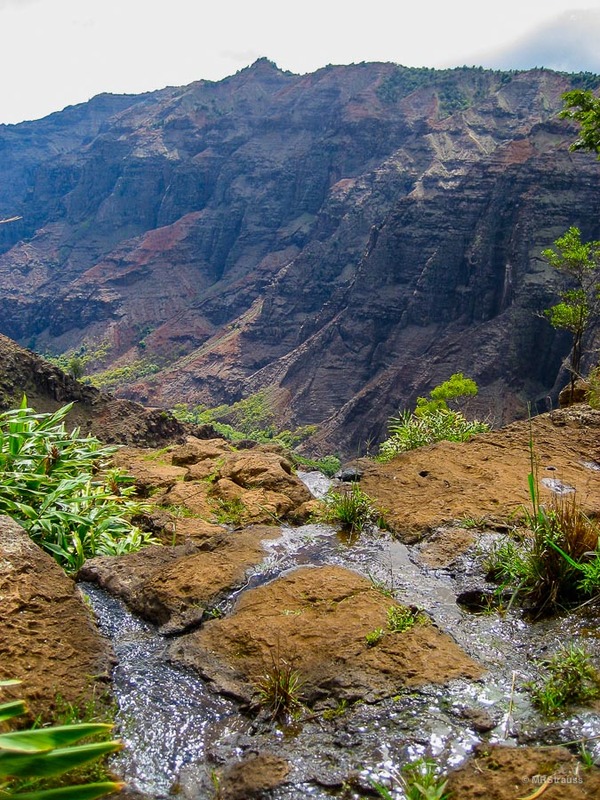 I thought the Na Pali coast trail (Kakalau Trail) would be too much for us this time and we did see the coast by both boat and helicopter; still, I wanted us to do some hiking on Kauai. The more research I did, the more I realized there are a lot of unique environments on Kauai. 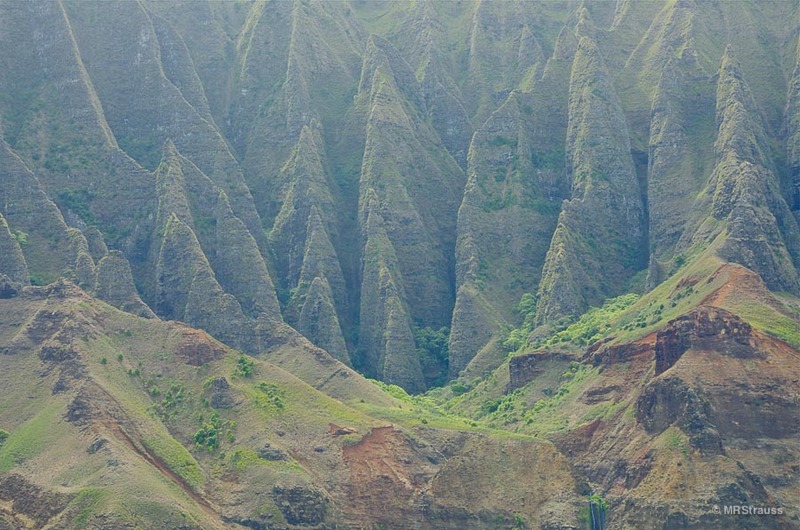 We decided to go with Chuck Blay and his company Kaua’i Nature Tours on a hike into Waimea Canyon. Although Chuck has a PhD. in geology, he was able to explain the native plant life and the formation of the islands and canyon so that we could make sense of what we were seeing. You could read a book about Hawaii’s geology and fauna, but when you learn about something as you’re looking and touching, it creates a much more memorable experience. We have learned about basalt several times and even have a little geology kit with samples, but my kids didn’t really understand the processes that created it until they got to see it, to feel really massive pieces of it and see how the forces of nature had shaped it in situ. In some ways the canyon looks like the Grand Canyon and it is often called the ‘Grand Canyon of the Pacific,’ However, it was created by a completely different process and has a different color scheme. We hiked to the top of a waterfall and ate our lunch to the majestic view of the canyon out to the ocean. You can’t get that in a restaurant. Our last day on Kaua’i, we visited Allerton Gardens. Wow. The tropical profusion was both beautiful and strange. 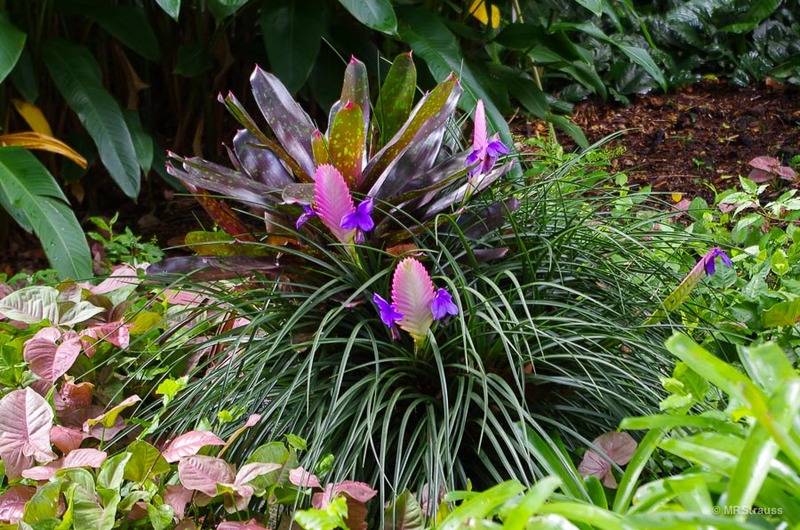 The year round growing season gives plants the opportunity to get creative. We saw breadfruit trees while our guide explained some of the research the institute was doing to bring breadfruit, which is a good staple food, to regions with food shortages through their hunger initiative, we smelled the very stinky fruit of the skunk tree, learned how vanilla is grown (it kind of looks like it’s being tortured)… My kids thought the best part was sitting in the big ficus tree roots where there were some fake raptor eggs. This was of course where the scene from Jurassic Park was filmed. Life finds a way. The next island was Maui. 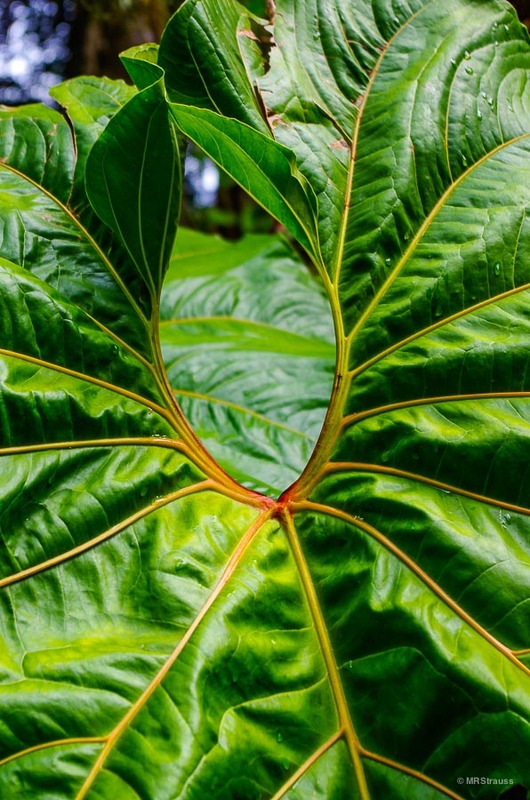 Kaua’i is often called the garden island and, while Maui looks drier from the western side, if you head out to Hana you’ll probably think Maui is the jungle island; I saw several of the tropical plants I have in my home— only here their leaves were platter size or bigger. Now I feel like I’m keeping my houseplants from reaching their full potential. We decided to stay in Hana to enjoy some of the different beaches, waterfalls, and hiking out that way. 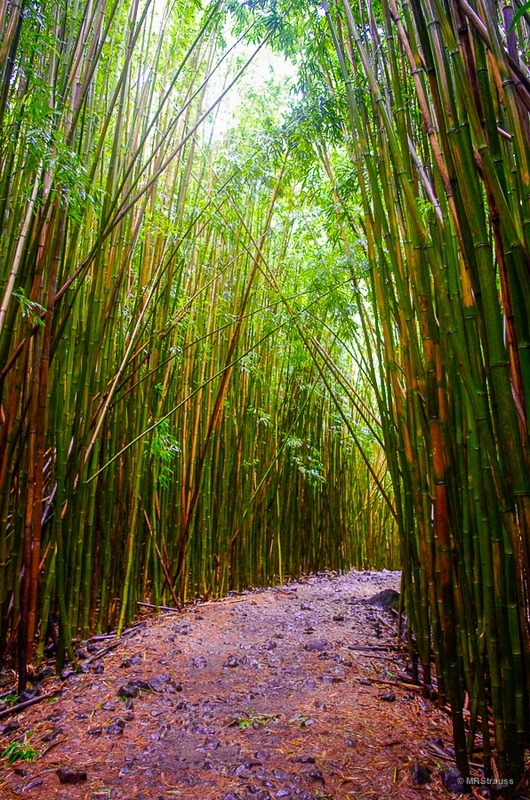 To get there you have to take the ‘road to Hana’; many guide books describe it as a winding road. We have winding roads where I live; this was not a winding road, this was a very long series of left and right turns. My older daughter threw up on us in the car— the first time since she was a baby. Hana is a small town with just a couple of ‘eat places,’ Hasegawa General Store, a luxe adults only hotel, a few condos, and some other small shops and places to stay. And it is unbelievably lush. 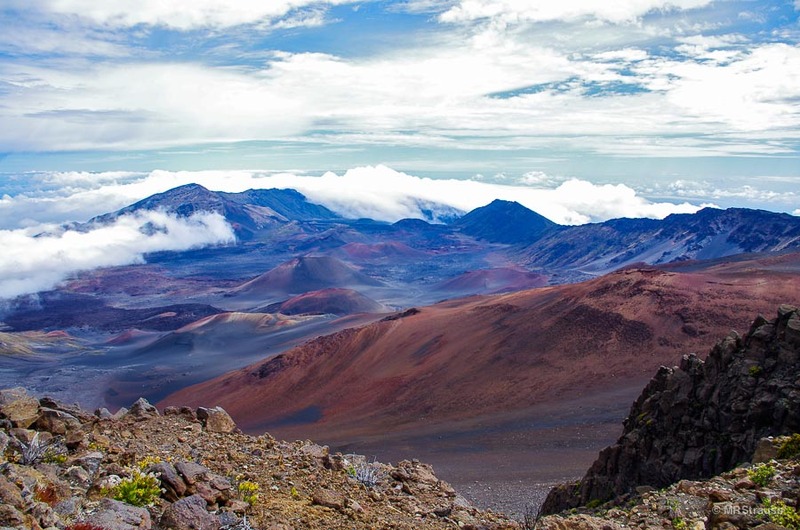 On our first day, we headed for the Kipahulu side of Haleakala National Park. On this side of the park, you have a rainforest with waterfalls that run out to the sea after a series of pools called ‘Ohe’o Gulch. The pools are also referred to by their tourist attraction name: ‘Seven Sacred Pools’— although since it had rained on the mountain the night before, they looked more liked the seven stages of the great muddy deluge. No swimming in sacred water for us, so we headed up the Pipiwai Trail. 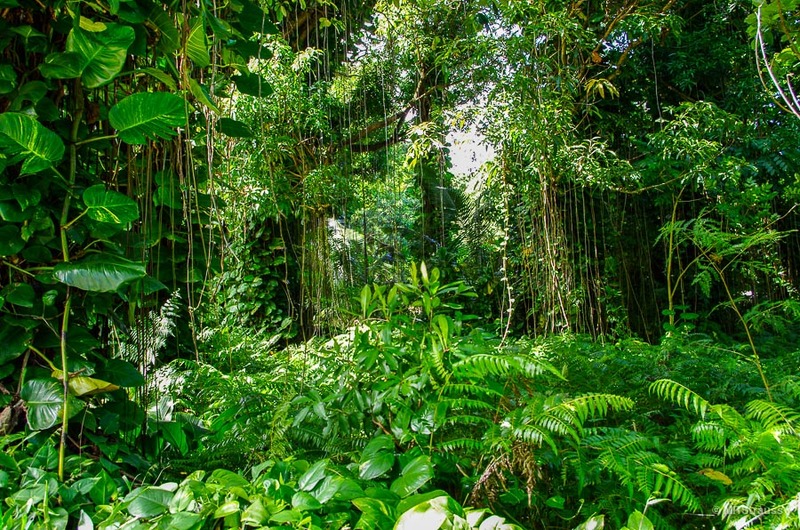 This is a stunning trail leading over waterfalls, past a huge Banyan tree, through a zen grove of bamboo, and finally to the base of 400 foot Waimoku Falls. I usually try to avoid writing too much advice about what to do, but here I think it’s warranted. This part of the park is a rainforest, which means it rains a lot. A few other hikers actually hiked in their bathing suits, so that’s an option, but the main thing is not to wear hiking boots. Sturdy water shoes, like Tevas, are the best footwear for this trail and especially the stream crossing near the falls (a group in flip flops did pass us, but gee I would feel like an idiot if I wiped out— and I wouldn’t be able to chalk it up to youthful indiscretion). We didn’t go right up to the falls or swim in the pool below it because there was a flash flood warning in effect that day and the ranger had emphasized to us that you never know when a glut of debris and water or a large log will come over the falls when they’ve had a lot of rain. Still, that couldn’t take away from the fantasy of walking through the jungle and coming to a magnificent waterfall. I’m beginning to think Hawaii was born under a water sign as the ocean and the waterfalls make all the rules here. The next day we drove to the other side of Haleakala National Park, taking the road that goes along the southern part of the island. I had read some nerve-wracking descriptions of the road and some folks we asked in Hana said not to take it, but Google had driven it and other Hana natives said it would be fine. It winds for awhile just like Hana Highway (we did pass what looked like a dinosaur-sized air plant on the road that had fallen off a cliff and, if it had fallen on the car, would have done serious damage— yes, I told you the plants out here are really big, that’s how big— insurance claim size). It was graded gravel and dirt for a bit and then we came onto a part of the road appeared to be ‘hand-paved’ by dumping small buckets of asphalt until it looked like a road. There were also some cows— cows have waterfront here. Then we came to a modern, paved section around the back of the volcano. Suddenly all the green was gone— replaced by reds, browns, and yellows. Then the road opened up to a spectacular view of the island and the ocean, passing a sea arch along the way. Just when we thought we were there, we had almost as far to go— you have to zig zag your way up above the cloud line on a guardrail-free road to get to the ranger station at the summit. Some folks even gather up here to watch the sunrise; we were here to hike on the Sliding Sands Trail. WOW! 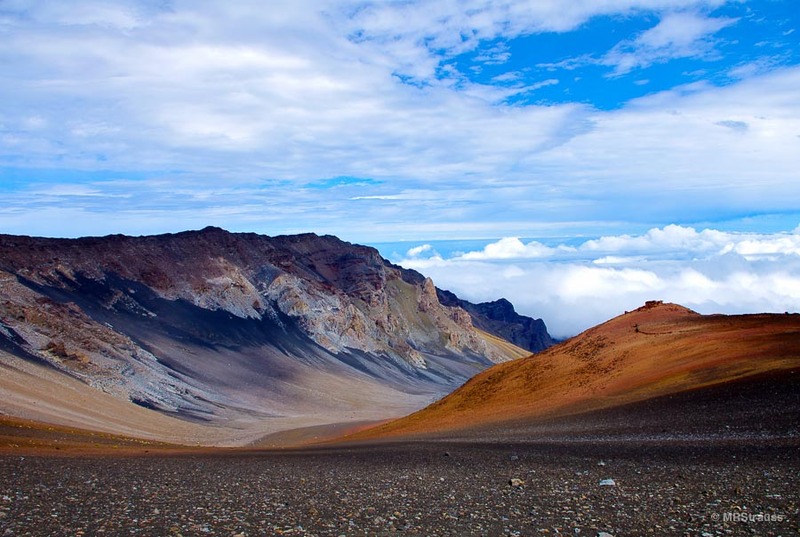 The scenery on this trail is like something from a science fiction movie and a surrealist painting: the landscape sweeps down, dotted with smaller cinder cones and dappled in red, brown, orange, yellow, and purple. It looks exactly like the photos you see on the web— you could not saturate it any more. Hawai’i is a place where you can put your camera on automatic exposure and get a mind-blowing photo. On our way back, we passed several tour buses coming from Hana, so I guess the road is fine— in daylight, with a full tank of gas, and a good spare tire. We decided to explore some sites closer to Hana before it was time to move on; thus began our quest to see all the different colored sands of Hawai’i. 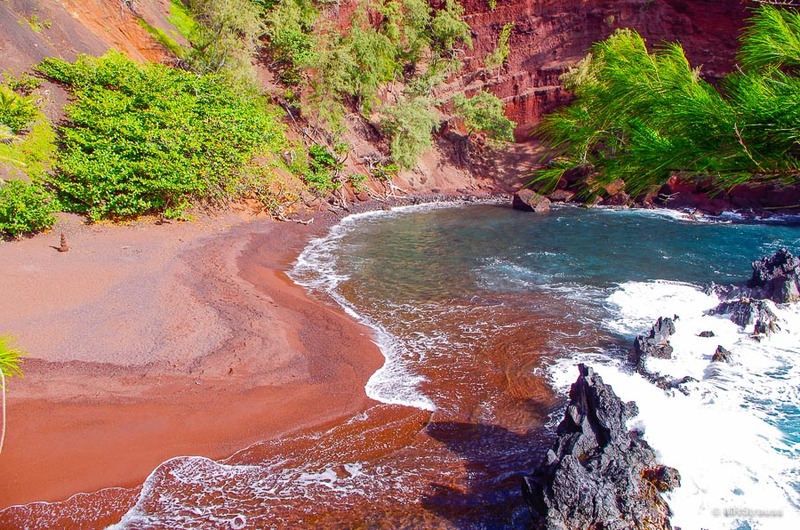 Hana has a red sand beach called Kaihalulu Beach tucked away behind a headland. There are plenty of websites with directions for the trail and all warn that it is a very short but narrow, eroded, cliff hugging trail that should only be done at low tide. I agree. We went at low tide and found the cliff hugging part to be dry and not slippery on that day, so we managed to get there without feeling that we were taking undue risks— but as we all know, anything can happen. As usual, a woman in flip flops with her dog passed us on our way out (I say ‘as usual’ because I seem to encounter people wearing what is considered very inappropriate footwear on everywhere we hike). The red sand is more rust colored but it punches out the turquoise in the water creating the most striking natural color sensation I’ve ever seen. Our next stop was a nearby black sand beach at Waianapanapa (I’d like to buy a vowel, please) State Park. The thing about the black sand it that it’s glittery; you can’t really photograph it unless you use a star filter. For about ten minutes we had all this glittery beauty to ourselves and then Scotty beamed down an entire tour bus of people. As soon as they hit the beach, they were all on their cell phones— except one guy who was taking pictures of everything with his ipad. There was supposed to be a trail along the shore that we could have taken back to Hana, but I couldn’t pick it out. Darn. I love ocean trails. This was just at the mid-point of the trip, when it starts to feel like it’s going by fast. Next, we headed to the Big Island and getting there was half the fun— security at the airport was a phone with a note on the counter to call for check-in and the pilot was both the ticket taker and baggage handler. A reminder of air travel’s simpler days. Staying in Hilo put us closer to Volcanoes National Park and away from the beach resorts. Hilo looks a lot like where I grew up— a once thriving place that has fallen on hard times. Bits and pieces of Hilo’s former glory days poke out here and there. And just like my town, there are a few green shoots sprouting up: a couple of quirky boutiques and a few trendy cafes. We stayed at the Hilo Honu Inn owned by Bill and Gay. Their top floor Samurai Suite is a Japanese tea room that was brought from Japan and reassembled in situ. I couldn’t believe how soft and warm the tatami mats felt underfoot. It would be here, courtesy of Gay (she dances with a local halau), that we would learn about real Hula dancing— not the sequined hip sashaying from the tourist aimed luaus. She showed us a few traditional dances and then how each move expresses a part of the story. All the fierce beauty of Hula came out and all the coconut bra cheesiness disappeared. Hilo is also where the Merrie Monarch Festival for Hula takes place each year attracting the best halaus (hula schools) and performers. I don’t know what my chances are, but the festival is on my wish list. But we were here from some volcanic action and volcanoes we would see. With volcanoes, there is as much going on underneath the ground as there is above it. Harry Shick, who runs Kazumura Cave Tours, just happens to have the longest lava tube known in the world in his backyard. This lava tube was bizarre: huge and almost perfectly round, like it was created by a giant worm, and with a semi-gloss coating of black on the walls, it made for one very dark cave. Harry was another stoke of luck for us: a very knowledgeable guide who can explain things in terms that make sense to the rest of us. The lava creates a surprising number of structures depending on its temperature, flow rate, and mineral composition. 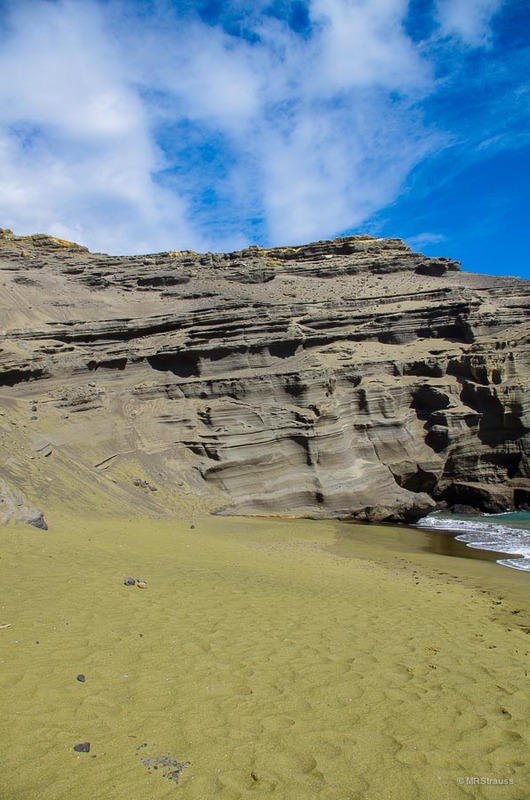 Today was our day to head south to seek out Papakolea, the green sand beach. On our way we stopped at Punalu’u, a black sand beach to see some more black sand and hopefully some sea turtles. There were a lot of turtles on the beach, but also quite a few tourists and, despite signs asking that we give the turtles a wide berth, many people felt the need to have a picture of themselves touching a turtle. We found a few away from from everyone and watched them from afar. 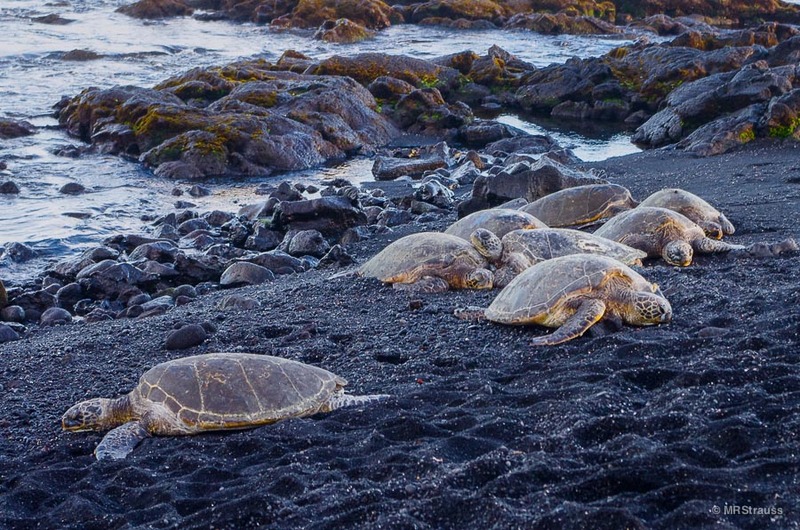 It seems like such a struggle for them on the beach; they even appear to take a nap after every few feet. After a bit of a drive and one wrong turn, we somehow found the parking area for the green sand beach. There are a bunch of islanders with four-wheel drives willing to wisk you there for a fee, I think one said $35. They seemed like good guys and I haven’t read anything warning folks to beware, but if you do that, you’ll miss the natural exfoliating facial you’ll get by walking— wind defines the southern tip of Hawai’i as much as rain defines Hilo. We walked for a little over an hour before we could see some green poking up from the far side of the cove. You enter from the back and climb down; it looks steep and scary from the top, be you’re never on an exposed ledge, so even a scaredy cat like myself was able to do it. And it is totally worth it. The color of the sand is more of a khaki green, but once you pick it up, you can see it is make of finely crushed olivine crystals. I need a star filter for my camera. There were maybe a dozen people, some swam— not something I would chance. When we got back to the car we scared ourselves— the sweat and the wind had given everyone giant sand mustaches. 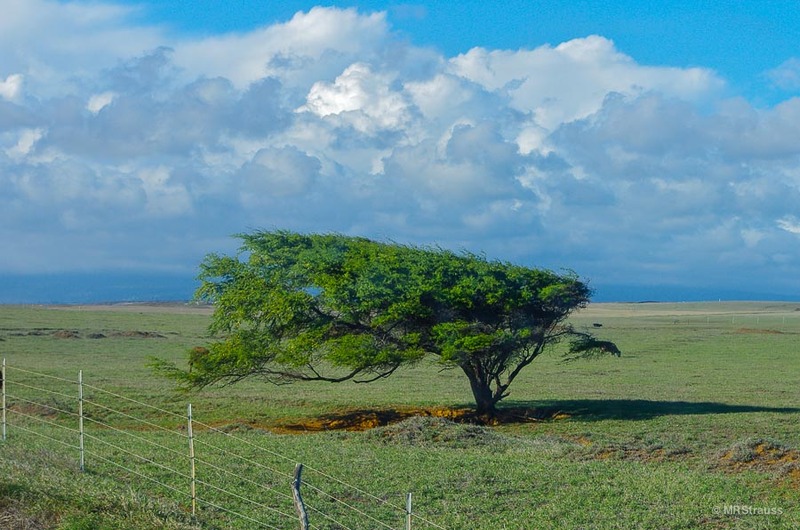 Wind sculpted tree on the southern tip of Hawai’i. We were definitely tired heading back, but as we approached Volcanoes National Park at dusk, we saw quite a few cars going in and decided to see what was going on. 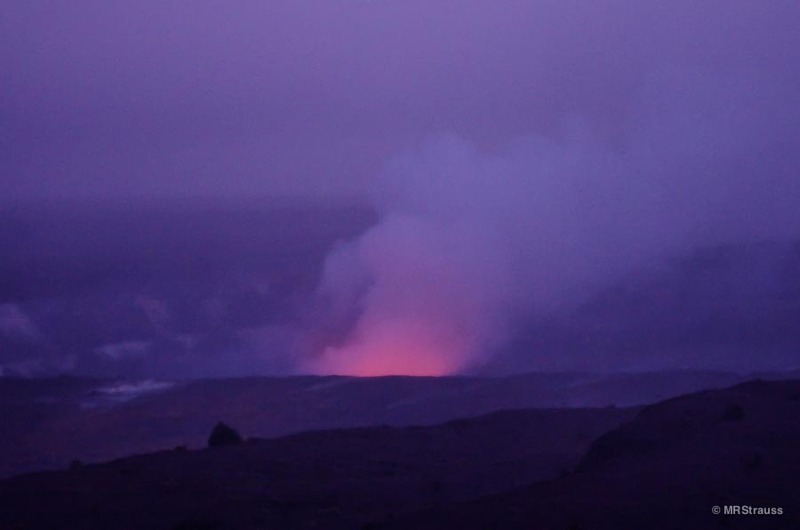 This is the home of Kilauea, one of the most active volcanoes on earth. When we stopped by after the lava tube hike, we didn’t see anything but steam rising from the crater— you can’t get very close. At dusk though, the show begins: the crater was glowing and changing with the light from purple to orange and finally vermillion. I love vacation days like this— beautiful turtles, sand made of gems, glowing volcanoes. There was still one more volcano related thing we wanted to do: hike across the still steaming crater of Kilauea Iki. The trail begins along the rim giving you an almost birds-eye view before you descend into the crater. If you see any hikers at the bottom, they’ll look like ants. 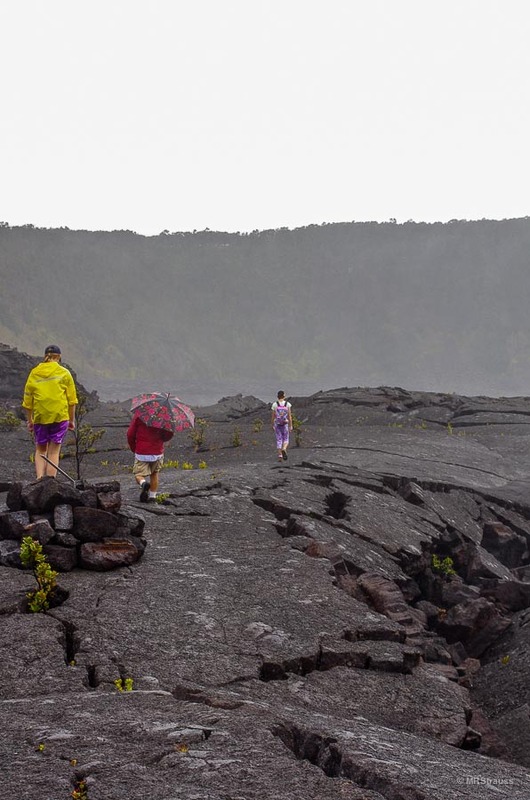 Once you get to the crater floor and scramble over the massive pieces of upturned and ripped lava, the effect will flip— now you feel like an ant. The floor is warm; light rain dries on it instantly. Some of the vents have steam coming out; we have lunch sitting next to one of these. Wow. We spend our last day on the Big Island around Hilo. 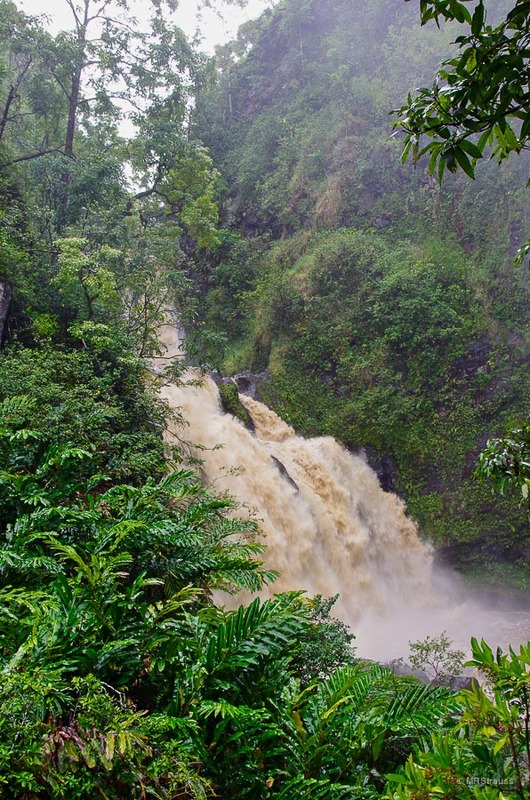 We take in Rainbow and Akaka Falls, which are unfortunately not very pretty due to the intense rain the night before. On the other hand, Hawai’i Tropical Botanical Garden seems to have benefited from the rain— the garden was like a B-12 shot of flora and fauna. Back in town, we have our first ‘plate lunch’ at Blane’s: roast pork with white rice and macaroni salad— the last two I would never think to put together. Around town, I score some signed posters from the artist who creates them for the Merrie Monarch Festival as my souvenir before we head out to Puna to see some of the more recent lava flows and visit some trees that were flocked with lava at Lava Tree State Park. Eventually, we come to where the road stops because lava flowed over it. There are a few ‘new age’ vendors selling crystals and hats woven from palm fronds. We walk out over the black lava to the ocean. I don’t know if people are planting them or they’ve landed here, but the lava is studded with sprouting coconuts. In twenty years this will be a beautiful beach with swaying palm trees and someone will clear out the crystal people and build an exclusive luxury resort. Honolulu’s Waikiki Beach seemed like a fun place to end our vacation. 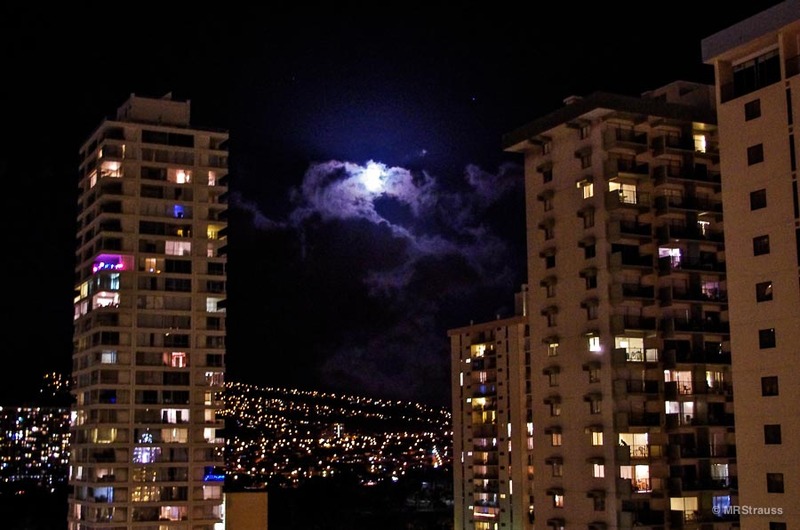 We stayed in the penthouse apartment at the Aqua Bamboo Waikiki and, while not the luxury accommodation that most of us think of when when we hear ‘penthouse’, it was spacious, offered sweeping views of the city, and the all-important kitchen. Wandering a few blocks from the hotel we spy a line. It’s for Marukame Udon Tempura Musubi. There is a chef in the window wielding and enormous piece of dough into fresh udon noodles. The line moves quickly, almost too quickly for us since we can’t decide what— or figure out how— to order. We end up with a bowl of steaming udon with several toppings and tempura. After one bite, we decide to spend the rest of our time in Waikiki mastering the art of ordering food here. Everything we have there is the food equivalent of cashmere. In the lobby of our hotel, my younger daughter plucks out a brochure for Sea Life Park with dolphins all over it. This was supposed to be our day for going to Chinatown and exploring Honolulu, but she was on a mission and loaded with missionary zeal— otherwise known a begging. A few year ago we visited Discovery Cove in Florida, and although she swam and played with the dolphins, she needed the trainer to hold on to her. Never in my life did I imagine she would be afraid of a dolphin, but she was— and very much so. Now she wanted a chance to put that behind her and I have some very expensive pictures to prove it. The park was cute and my kids enjoyed themselves. We also finally tried the sushi made with Spam — called musubi— that we had seen on practically every food store countertop. It might be something you have to work up to, but always good to try new things. Spam has a long history in Hawai’i, having come over with the GI’s and somehow infusing into the local cuisine. The next day, my older daughter and I did a kayak tour with Kailua Sailboards & Kayaks. I thought it would be a nice paddle over crystal clear waters in a protected reef area— and it was supposed to be except on this particular day they were having ‘unusual weather’ and high winds. Of course. One wave was so big it took the kayak my daughter and I were in and pointed it torpedo style at the couple in the other kayak on our trip. We also did something that in hindsight, and knowing how unpredictable the ocean can be, was dangerous: my daughter got in what looked like a calm tide pool— called the Queen’s Bath on Mokulua Island— but almost immediately a wave rushed over it. She looked like she was in a washing machine and I almost had a heart attack. Luckily she had just a few small cuts from the very sharp lava that lined the pool. Brutally beautiful. We didn’t want to leave Oahu without a visit to Pearl Harbor. We’ve all seen the film: the planes flying low, the ships laying on their sides burning. The site does a good job paying homage to a really bad day. At the memorial for the USS Arizona, where 1,102 sailors and Marines remain entombed, we watched oil droplets slowly make their way to the surface and disperse into an iridescent sheen— the effect made it feel connected to the present, as if in a small way it was still happening. We took the extra battle stations tour on the USS Missouri, or Mighty Mo, which gave us a close up look at the turrets and controls for the big guns and the engine rooms— everything on a battleship is super-sized except where the people go— the people spaces are tight. This is the ship where, in Tokyo Bay on September 2, 1945, the Japanese surrendered and ended World War II; a plaque that seems almost too small for such a momentous event, marks the place on deck where the agreement was signed. We knew the last day would come as it always does. Our late night flight gave us time for a very fitting ending: a hike up to the ridge of Diamond Head, the tuff cone volcano you see from Waikiki beach. I thought it was the perfect ending. Food: As with every place we go, we find food and drinks we wish we could get at home. Not fancy stuff, but simple comfort food like hibiscus juice in Egypt, açma in Turkey, or star shaped ravioli in Italy. In Hawaii, it was produce. We saw at least five different kinds of avocado, dragon fruit, rambutans, purple sweet potatoes, carrots in different colors, mangosteen, different varieties of papaya, little eggplants, all different shapes and sizes of mangoes, white pineapple, different kinds of bananas, giant bunches of chives. We saw unique fruits and vegetables everywhere we went and we tried as much as we could. But the best thing was POG; I avoided it at first because it sounded yucky. Big mistake. POG (pinapple, orange, guava) is the juice of gods. 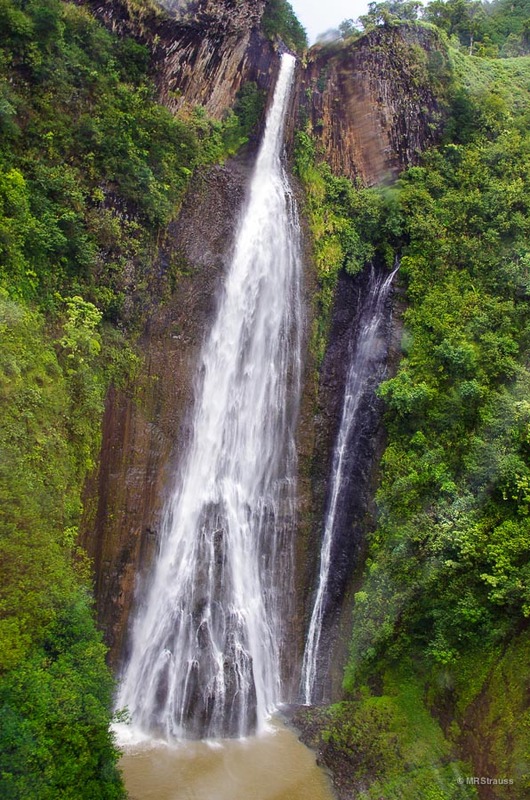 Guide Books: The Ultimate Kauai Guidebook, Maui Revealed, Hawaii the Big Island Revealed, Oahu Revealed. Accommodations: Grand Hyatt Kauai Resort & Spa, Hana Kai Maui, Hilo Honu Inn, Aqua Bamboo Waikiki. This entry was posted in Wander and tagged Akaka Falls, Allerton Gardens, Aqua Bamboo Waikiki, Avocado, Big Island, Blane's, Diamond Head, Dragon Fruit, Grand Hyatt Kaua'i Resort & Spa, Haleakala National Park, Hana, Hana Kai Maui, Hawai'i, Hawai'i the Big Island Revealed, Hawai'i Tropical Botanical Garden, Hilo, Hilo Honu Inn, Honolulu, Hula, Jurassic Park, Kaihalulu Beach, Kailua Sailboards & Kayaks, Kaua'i, Kaua'i Nature Tours, Kazumura Cave Tours, Kilauea Iki, Kipu Zipline Safari, Lava Tree State Park, Lawai Beach, Lei, Maha'ulepu Hertige Trail, Manawaiopuna Falls, Marukame, Maui, Maui Revealed, Merri Monarch Festival, Musubi, Na Pali, Oahu, Oahu Revealed, Outfitters Kaua'i, Papakolea, Pearl Harbor, Pipiwai Trail, Puna, Punalu'u, Rainbow Falls, Rambutan, Savage Shrimp, Sea Life Park, SeaFun, Sliding Sands Trail, Spam, The Ultimate Kaua'i Guidebook, USS Missouri, Volcano, Volcanoes National Park, Waianapanapa State Park, Waikiki Beach, Waimea Canyon, White Pineapple on November 30, 2013 by mrstrauss.